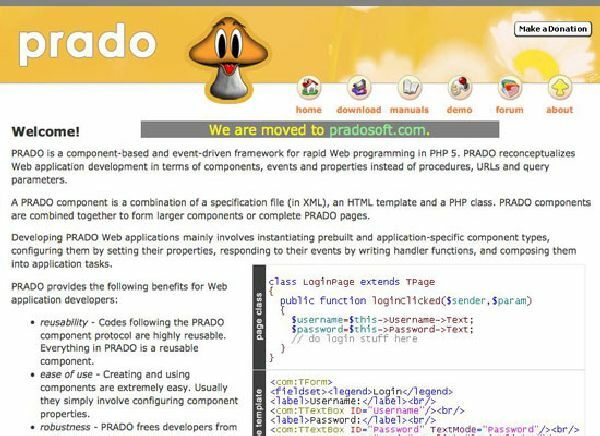 PRADO PHP is an open source PHP web programming framework for developing professional web applications. PRADO abbreviates to PHP Rapid Application Development Object Oriented. 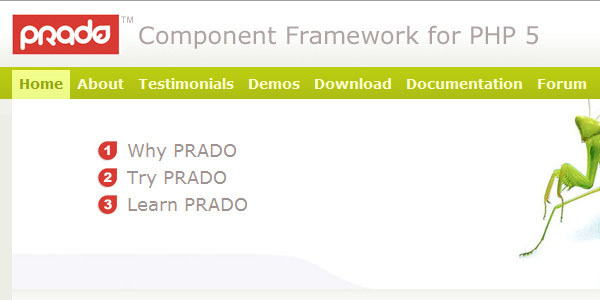 PRADO is allows event driven programming through its component based model. PRADO PHP has a pluggable & configurable modular architecture with stupendous support for Ajax Components. Prado as well supports localizable and customizable error handling , selective output caching & generic caching modules. In order to use this framework you only need a Web Server with PHP 5.1.0 and is ideal for building both commercial and open source applications. PRADO has a revised BSD license. You can use PRADO for building web apps that are user interactive , forums , e-commerce solutions , simple blogs, complex content management systems and even simple blogs. This framework has a wide range of caching techniques that will be of great help in accelerating various PRADO based web application so as to deal with the heavy traffic requirements. You can cache the various bits and pieces of a rendered web page or can make use of the various cache modules because of its modular architecture. The ultimate goal of PRADO is to make sure high level of reusability is achieved in web programming which means that not only one should be able to reuse their own code but as well have the provision to make the best use of others code thus reducing the development time. This is the reason for the creation of various components in PRADO. There is a protocol for writing different component for developing a web application and this is due to its component based feature. Component is nothing but a small procedure or a unit which one can reuse just by making some simple customizations and one can as well create novel components with the help of the existing ones. In order to smooth the process of interaction among the components this framework runs an event driven programming method which will allow the assignment of the extensible behavior to the components. Various end user actions such as clicking on a form submit button are considered as Server Events. Thus various functions or methods will be called automatically when these events take place for the desired action to happen. With event driven web programming it becomes easy for the web developers to focus on the business logic thereby reducing the redundant coding when compared to the conventional web programming strategy where in they have to deal with the GET and POST variables during form submission. Web Controls : One can create interactive web pages just by writing some simple lines of code with the help of various components provided by PRADO for web interfaces. For instance one can make use of the Data grid Component to create a web page that is in the form of a data table that allows sorting, deleting, editing and paging of the rows. Great Support for Reusability of Code :Web developers can easily integrate their whole application by reusing their previous work. Compliance with XHTML : The web pages generated using PRADO PHP are 100% XHTML compliant. Support for Event Driven Web Programming : You can capture various end user actions such as key pressing or mouse clicks as Server Events. There is support for selective and generic caching. 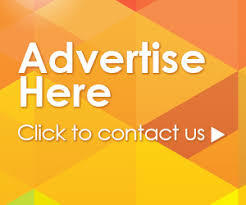 Various security measures are implemented such as Cookie Prevention , CSRF , XSS Attacks Prevention. Localizable and Customizable Exception and Error Handling with detailed message logging. PRADO will offer complete database support so based on the complexity of your web app you can choose a simple PDO based data access or a complete business object mapping scheme sqlMap or the popular active record. Web developers can accommodate their existing work as it is framework that is concentrated on the presentational layer.